The High Contracting Parties shall hold free elections at reasonable intervals by secret ballot, under conditions which will ensure the free expression of the opinion of the people in the choice of the legislature. This Article imposes obligations on States rather than creating rights for individuals. 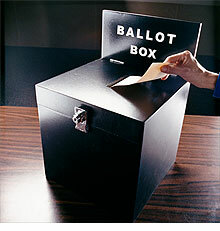 This provision includes the right to vote and the right of candidates to stand for election. States are under an obligation not to impose any form of pressure as to the choice of candidates at elections: Moureaux v Ors (1983) DR 97. Protocol 1 Article 3 does not require that every vote is given equal weight; different electoral systems all involve wasted votes and there is no obligation to introduce proportional representation. Access to the media must not be discriminatory. However, a wide margin of appreciation applies under this Article and the Strasbourg authorities have been slow to strike down national rules relating to election coverage (Tete v France (1987) 54 DR 52). So there is nothing controversial about the express terms of A1 31, however this Article has become something of a battleground for almost everything the Convention stands for, in the eyes of its opponents as well as its supporters. This is because the Strsabourg Court found, in Hirst v United Kingdom (2006) 42 EHRR 41, that the provision implies that all individuals have the right to vote, and that therefore the UK blanket ban a blanket ban on all prisoners serving a sentence of imprisonment is unlawful. The standoff between the UK and Strasbourg on this matter is as yet unresolved. The reason the argument has become so heated is that it turns on a fundamental question at the base of human rights instruments such as the Convention: Is it the right of the democratically elected Parliament to decide who their electorate should be? See the numerous case reports, news pieces and discussions on the prisoner voting issue here, here and here.